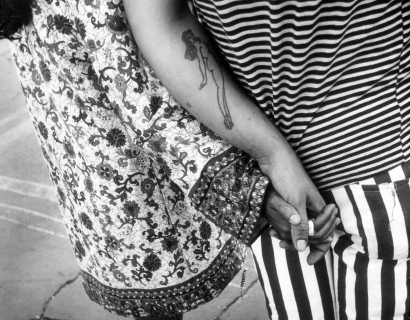 Steven Kasher Gallery is proud to present Leon Levinstein, a survey featuring over 50 vintage black and white prints by the celebrated master of street photography. Leon Levinstein (1910–1988) is best known for his candid, unsentimental, often acerbic figure studies made in New York City neighborhoods -- from Times Square, to the Lower East Side, to Coney Island. This exhibition will feature images that reflect the artist's fearless approach to the medium. Levinstein's graphic virtuosity, his raw gestures and monumental bodies, balance compassion and cruelty as he caresses and skewers his fellow citizens of the streets. This is the first survey of Levinsteins’s work since his major exhibition at The Metropolitan Museum of Art in 2010. Born in West Virginia in 1910, Levinstein moved to New York in 1946 and spent the next thirty-five years obsessively photographing strangers on the streets of his adopted home. With daring and with dedication to his subject, Levinstein captured the denizens of New York City at extremely close range. He framed the faces, flesh, poses, and movements of his fellow city dwellers: couples, kids, big shots, beggars, prostitutes, proselytizers, society ladies, sunbathers, and characters of all stripes. Levinstein was mentored and supported by Alexey Brodovitch, artistic director of Harper's Bazaar, and Edward Steichen, the eminent photographer and curator at The Museum of Modern Art in New York, who both recognized his unique talent in the medium of photography. He was also greatly influenced by the distinguished photographer and teacher Sid Grossman of the Photo League. In the 1950s and 1960s, Levinstein's work appeared frequently in photography magazines and books alongside that of his peers, such as Robert Frank, Richard Avedon, and Diane Arbus. Nonetheless, he rarely worked on assignment, as they often did; nor did he ever produce his own book of photographs. Instead, he devoted his evenings and weekends to photography. Levinstein earned his living as a graphic designer, not as a professional photographer, and remained a solitary figure, aloof from the art world. This lack of broader recognition did nothing to slow Levinstein's voracious and unrelenting eye and he continued to photograph until his death in 1988. Levinstein lived loneliness to the extreme. He never married, had few friends, and alienated those who wanted to advance his career. That independent spirit informed the way he saw the world. He could skulk though crowds, blend in, observe things that others would miss. The very traits that alienated him from the world also allowed him to see it in a unique way. He summed it up in a 1980s interview. "You gotta be alone and work alone," he said. "It's a lonely occupation, if you wanna call it that." During his lifetime, Levinstein's photographs were featured in a single solo exhibition — at Helen Gee's Limelight Gallery in 1956 — and in numerous group exhibitions at The Museum of Modern Art, including Steichen's famous 1955 exhibition The Family of Man. Levinstein's work was also included in group exhibitions at The Metropolitan Museum of Art; International Center of Photography, New York; Corcoran Gallery of Art, Washington, D.C.; and Barbican Art Gallery, London. In 2010, The Metropolitan Museum of Art mounted an exhibition entitled Hipsters, Hustlers, and Handball Players: Leon Levinstein's New York Photographs, 1950-1980. Leon Levinstein's photographs are held in the permanent collections of The Art Institute of Chicago; Center for Creative Photography, Tucson; the Hallmark Collection, Kansas City; the National Gallery of Canada, Ottawa; The Metropolitan Museum of Art; The Museum of Modern Art; and the San Francisco Museum of Modern Art. A retrospective exhibition catalog, The Moment of Exposure: Leon Levinstein, was published by the National Gallery of Canada in 1995, and the monograph Leon Levinstein: Obsession was published in 2000. A monograph on Levinstein is forthcoming from Steidl. Leon Levinstein will be on view from November 8th through December 22nd, 2012. Steven Kasher Gallery is located at 521 W. 23rd St., New York, NY 10011. Gallery hours are Tuesday through Saturday, 11 AM to 6 PM. For more information or press requests please contact Christiona Owen at 212 966 3978 or christiona@stevenkasher.com.